Pico projectors are something of a gamble. Small and easy to carry they might be, but what they give in terms of portability these pocket-sized projectors often take in brightness and resolution. After all, where's the benefit of a small projector if the presentation it produces makes you look unprepared - and ill-informed? 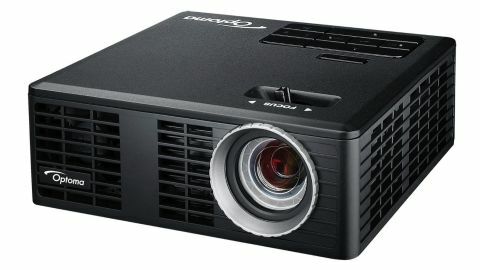 Optoma gets around all of these problems with the ML550, which is the most versatile of all pocket projectors, but the much-needed extra brightness it offers comes with a high price tag of about £470 that, ultimately, could cost it. We want it all - a small size and a small price - but in reality the shrinking of tech normally carries a premium. And so it is with Otoma's ML550, whose mere 380g weight and 39x105x106mm dimensions put it ahead of a D-SLR camera in terms of portability. However, it's not its size, but its brightness that makes the ML550 the leader of the pack; its 550 ANSI Lumens, delivered by an LED lamp rated at 20,000 hours, is about five times brighter than most of its competitor products. Its pixel resolution of 1,280 x 800 is handy, too, though the 4:3 shape is more suited to older laptops. Not that this is at all an old-fashioned product; 3D readiness makes sure of that (even if extra, separate 3D specs need to be bought), though, arguably, of more importance is its built-in 1.5GB flash drive that can host - and play, thanks to its built-in architecture - all kinds of presentation-centric files and formats. Look around the back and the sheer versatility of the ML550 quickly sinks in. As well as a single HDMI input (that can take a feed from a Blu-ray player or games console as well as from a smartphone or tablet, thanks to its MHL-ready status), the ML550 has a USB 2.0 slot for thumbdrives, a universal I/O slot (as well as a cable that supplies either audio or a feed from a laptop), and a microSD card slot. Unlike some mini projectors that take their power exclusively from the laptop they're linked to - such as the Philips PicoPix PPX2055 - the ML550 uses a rather large array of cables and separate power pack; but that's the flip-side of its otherwise more versatile design.